Thaddaeus Ropac, Barcelona Symposium 2017. Talking Galleries. The International Think Tank for Galleries is proud to announce its sixth Barcelona Symposium, to be hosted by the MACBA museum on January 22 and 23, 2018. The Barcelona Symposium is a two-day programme of debates, conversations and thought-provoking reflections on art gallery management. It brings together prominent art world figures to discuss current issues, share experiences and rethink models relevant to the art business sector. Providing a proper space for gallerists to exchange their views and expertise with fellow professionals remains at the forefront of Talking Galleries’ founding principles. In order to fulfill this goal, it connects leading speakers with a committed audience made up of gallerists, collectors, journalists, curators, artists, and fair directors. The 2018 programme will address some of the most relevant matters in today’s art gallery sector, such as managing artists’ estates, new collaboration models for galleries, strategies and analysis of the online markets or gallery transition on to family members, among other actual concerns of primary interest in the field. Registration is already open! Register here to book your ticket—limited availability. Talking Galleries is an international think tank dedicated to generating debate and knowledge in the field of art galleries and the art market. Launched in 2011, it holds an annual symposium in Barcelona and organises talks and conferences in global art capitals such as Paris, Madrid, London or New York, where it has developed a strong network of local partners. Among its latest international events are TG Paris 2017, TG Seoul 2016/17 and TG Berlin 2015. 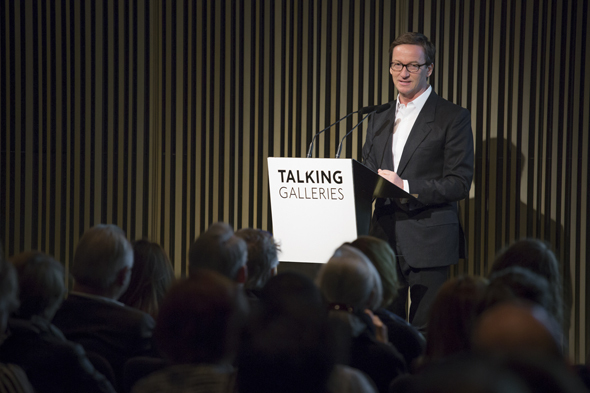 Visit the online video channel to watch Thaddaeus Ropac’s 2017 opening speech and more videos of our events in Barcelona and other venues.